Lutuo transmitter plug and play is a very handy device. It can work with 99.9% type and brand of devices such as TV, PC, CD Player, iPod, Kindle Fire, MP3/MP4, etc. Up to 32 feet working range, it is easy to realize auto pairing with Bluetooth stereo headset, Bluetooth headphones, speakers and other Bluetooth stereo audio systems, and you don't need to install the drivers. 2.If it is used on TV, before buying, please confirm whether there is audio output interface on TV such as RCA or 3.5mm interface. 1. Plug this product into your PC or laptop USB port. 2. Connect the product to the PC or laptop computer with audio cable (Note: 3.5MM audio output port or RCA audio ouput port). 3. Turn on your Bluetooth headset or speaker and enter the pairing mode (you may need to turn off your phone's Bluetooth feature). 4. Press the pairing key for about three seconds, the light flashes fast, and the equipment will realize automatic pairing. 1. The Bluetooth music transmitter has no relationship with the cellphone at work. 2. If you use the product on TV, please confirm which RCA interface is the audio output port. The device needs to connect the audio output port instead of audio input port. 3. 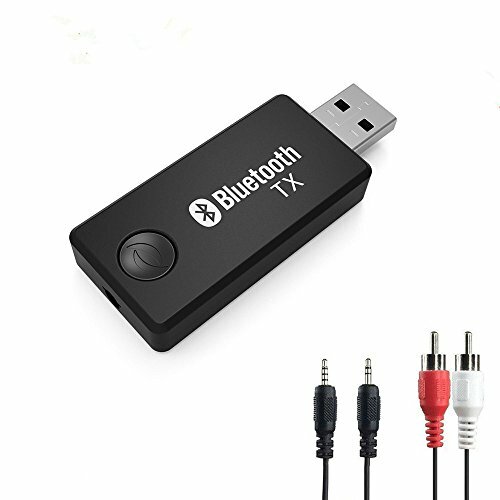 Bluetooth transmitter can not pair with your mobile phone, iphone or ipad, as they are with different Bluetooth protocols. It can only be paired with audio stream device, bluetooth headset or speaker (The smart phone or iPad is not speaker). 4. It is NOT a receiver. If you have any questions about this product by LuTuo, contact us by completing and submitting the form below. If you are looking for a specif part number, please include it with your message.